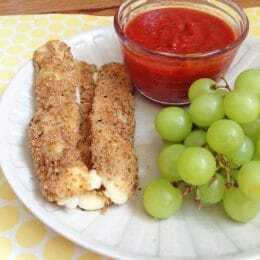 Crunchy baked Mozzarella sticks are made with whole grain bread crumbs and oven-baked for an ooey-gooey, high-protein treat. I just love to make over famously unhealthy foods. For one thing, my kids like to eat them. For another thing, it’s usually surprisingly easy to transform a recipe into a healthier treat that you feel good about sharing with your kids! This is one of those recipes. With a breading made from whole, sprouted grain bread and whole wheat flour, and an oven-baked cooking method that avoids the deep-fryer altogether, we’ve turned the ultimate crunchy/gooey appetizer into a healthy snack you can make at home, any time you’ve got hungry kids, and 20 minutes to spare. Set out a dish of marinara for dipping, a little fresh fruit on the side, and you’re ready to snack. When you’re reading to make these Mozzarella sticks, get three bowls ready for the breading: one with egg, one with whole wheat flour, and one with bread crumbs. Got a little helper in the kitchen? This recipe is great fun for kids who are too little to chop veggies. 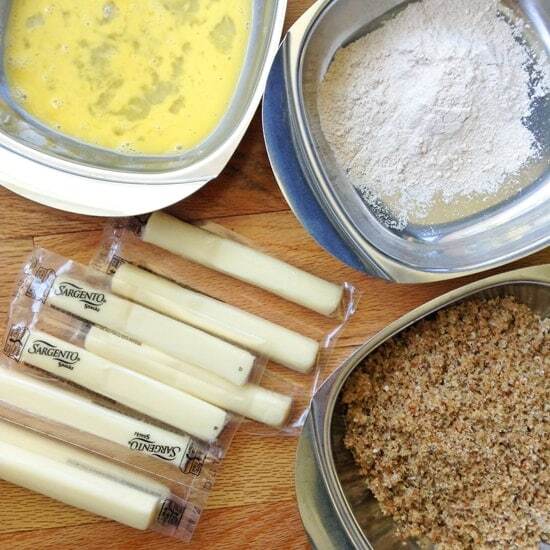 Unwrap your cheese sticks, and dip each one in turn into the egg, flour, and bread crumbs. Enjoy them while they’re hot and crunchy! They taste great dunked in a classic marinara sauce, or in our Beyond Veggie Dip. Do you have a favorite healthy makeover recipe? What is it? 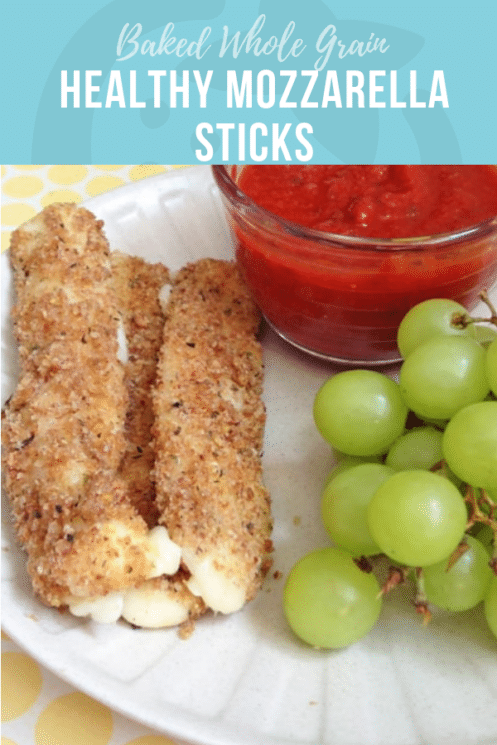 SO excited about these…my boys LOVE cheese and these would be a fun way to get them dipping and loving some not-friend cheese!!! i LOVe this! 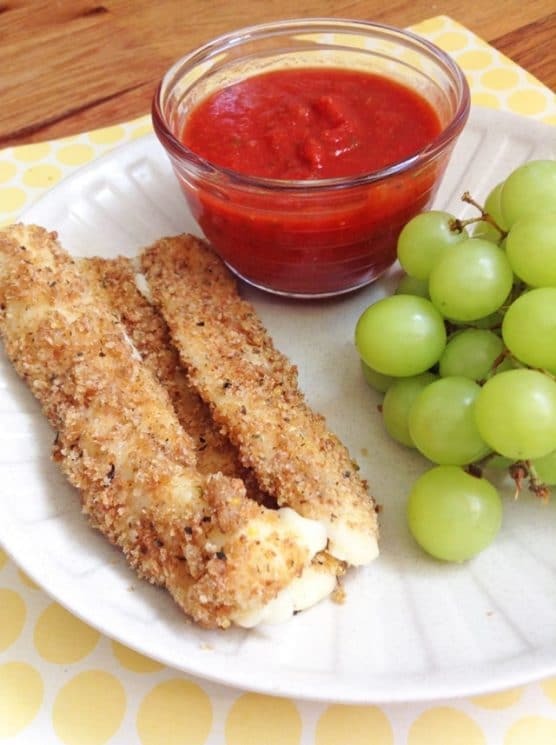 the healthy alternative for mozzarella sticks…what kid doesnt love string cheesy goodness?! If you want to fry these so they are nice and crispy, freeze the cheese first. Otherwise the cheese melts before the coating solidifies. Made it tonight and my girls loved it!!!!! Mine didn’t stay in stick form……they didn’t care though! Great idea! I just shared these in my “favorite finds.” I know my readers will want to try them as much as I do. Thanks for sharing! where can you get Panko? I’m in heaven! Thank you for posting this delicious recipe! These look great! Do you have any suggestions about how I could make these without egg? My little guy has an egg allergy. Milk maybe? Ideas welcome! I have found it at my regular grocery store. It is usual down the aisle with Ethnic food – usually by the Asian foods. Milk will work as a substitute, but it isn’t as thick as an egg and so I would suggest adding a little flour to make it a little thicker. Start with 3-4 tablespoons of flour and add cold milk gradually while stirring to help prevent lumps. Keep adding milk until it gets to the consistency you want. Then you can use it to dredge your cheese sticks. Good luck! Could you just cut up a block of cheese into sticks instead of using the cheese strings? Could I use cheese curds instead? I think you are missing some instructions because following your recipe exactly and the cheese sticks flattened out and melted and looked ghastly. They looked nothing like cheese sticks when done. On this recipe perhaps you can state to coat the cheese with the eggs and crumbs/flour, then freeze them, then re-coat them again and put in the oven. That is how professional Chefs do it so it doesn’t melt all over the place. Thanks for the tip. It probably depends on what kind of cheese you use. Our method worked great for us, but I’m sorry it didn’t work out for you! worth to try, it looks delicious!